Want to become our partner? Partner with us! After a bout of sickness or flu, it is important to hire a cleaning service to disinfect the house and make it healthy to live in again. We have all experienced it some time or the other. Someone in the house is sick and the disease may be a communicable one which could possibly start an epidemic in your house. People living in warmer climates suffer more from it than people who live in colder climates as germs multiply faster in warmer areas. Therefore, it is so important to pay attention to cleaning and disinfecting your house after sickness. You may hire a cleaning service in Dubai to help you with the task. 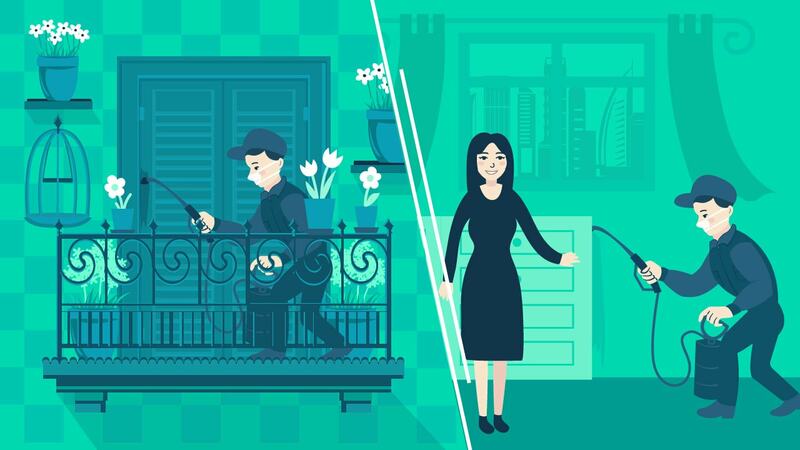 There are specialized cleaning services who deal with household disinfecting and you may even hire their services to ensure that your house is refreshed and free of the disease-causing germs. There are certain pathogens that can be passed on from one person to another by various diverse means. They can spread through air, water or direct contact with the sick person or the things that they may use while ill. It can spread through mucus, blood, breath, saliva and even sexual contact. The pathogens could be in the form of bacteria, virus, fungus or parasites. The most common of these diseases are gastroenteritis, flu and the common cold which are not too serious and you may get away with just a little more attention to the regular cleaning to ensure that the house is germ free. But, there are other diseases that are also communicable that are serious and may cause serious health concerns. These would include Tuberculosis, Hepatitis A & hepatitis B, HIV/AIDS, Small Pox, Chicken Pox, Measles, Mumps, etc. These diseases are serious and other family members and visitors in your house need to be protected from these diseases. Through direct or indirect contact with the sick person or their bodily fluids. The bodily fluids would include, mucus, sputum, blood, perspiration, saliva, etc. The diseases that can spread through contact are – staphylococcus, STDs including HIV/AIDS, hepatitis A, influenza, common cold, tuberculosis, etc. Through contact with contaminated substances like food, objects, surfaces, etc. The diseases that can spread this way include salmonella, E.coli, conjunctivitis, common cold, etc. Air borne and water borne diseases, where the pathogens travel through air or water and once they are inside our body, they can then replicate and cause diseases. Common diseases that spread through water and air include tuberculosis, typhoid, jaundice, measles, cholera, etc. Through insect or animal bites. A lot of diseases spread through animal and insect bites. Mosquitoes are the carriers for a lot of these diseases, but they are not the only culprits. Fleas, flies, rats, dogs, cats, all of these and many more living beings are capable of passing on diseases causing germs. The diseases that are most common through animal and insect bites include Lyme disease, malaria, yellow fever, plague, rabies, etc. If you come to think of it, these pathogens could be all over your house where ever there are people, animals or insects. So practically your entire house can be a big pathogen factory unless you keep a house that is cleaned and aired regularly. But there are places that are more likely to be contaminated than the others. The places where the pathogens are likely to thrive are places that are moist and warm. So your kitchen and your toilets are the first places you need to attack when you declare your war on communicable diseases. Besides, these there are certain surfaces and objects that are more vulnerable to carry pathogens just because they are touched the most by practically everyone in the house. These include door knobs and handles including those of your kitchen cupboards and appliances. Children’s toys, All remotes but especially the TV remote, phones, money, keys, etc. are the most vulnerable objects. These pathogens are easy to deal with. They only require conscientious cleaning by a maid or a cleaning service in Dubai. Water and air borne diseases occur because of contaminated water supply and polluted air caused by breathing, coughing or sneezing of a person suffering from an air borne disease. These need a bit more effort to eradicate from your house. This may require installation of special devices and the services of a professional disinfecting and cleaning service in Dubai. Insect and animals that cause diseases are likely to hide in dark places and breed in hidden neglected corners of the house. Mosquitoes, flies, mice, etc. can be kept under control by regular deep cleaning of the house and installing bug nets and mosquito screens on all the windows and doors. 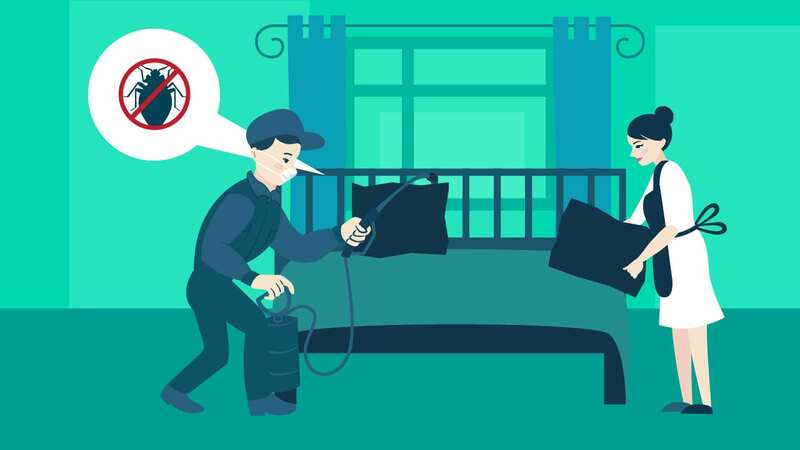 If you would like to know about the pests in a Dubai house and how to keep on top of them, then you can read it on the help4u.today blog posts Common Household Bugs Found in Dubai and Dealing With Them. 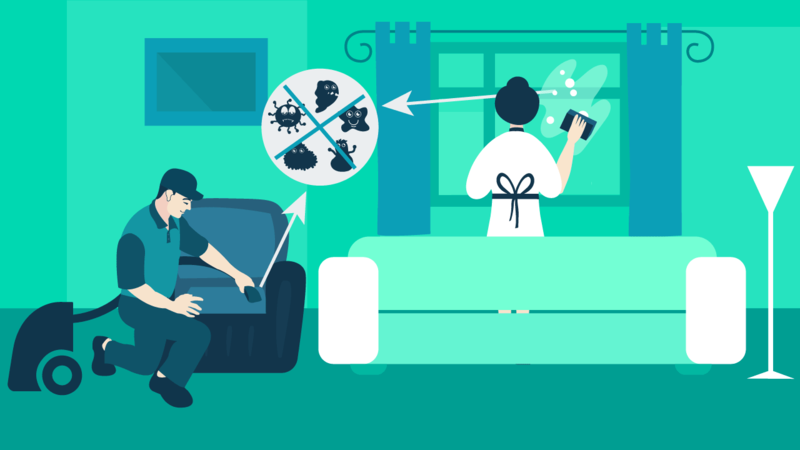 Now that you know how diseases spread, it is fairly easy to see how you can actually stop them from spreading from one person to another in your house and to disinfect the house to kill the germs. * Isolate the sick person and make sure that others do no come in direct or indirect contact with them or their bodily fluids. This may be a bit hard if there are children at home, but instilling a habit of frequently washing hands should be able to contain the spread of the infection to some extent. Keep all the clothes, towels, bed linen of the patient separately and wash them separately from the other clothes. Dry them in the sun to disinfect them completely. Air the bedding and pillows, mattresses – leave them out in the sun to disinfect them. Sun emits UV rays which kill a lot of common pathogens and get rid of fungus that may cause irritation and rashes. So, make it a habit to put the bedding out in the sun at least once a year if not more often. Use disinfecting wipes to clean all the surfaces and objects that were touched or handled by the patient or other people. This is a habit that should be cultivated not only when there is illness in the house but to prevent illness too. So, wiping remotes, handles, light switches is a good way to prevent diseases. Deep clean the toilets and kitchen. We have already done several posts on cleaning and deep cleaning and you can look up the blog posts for more detailed information. Declutter your home and find a professional cleaning service in Dubai to come and deep clean the house to rid it of all the insects and pests. When outside the house, apply insect repellents and wear clothes that cover your arms and legs. Make sure that there are bug nets on all the outside openings including windows and doors. Keeping the bugs and pests out is the only sure way of keeping your house free of insect and animal borne diseases. Make sure your house pets are properly vaccinated and are not carriers of any disease. Airing the sick room is a great way to not only refresh the room but also to get rid of the germs that linger in the air. Open the windows and drapes to let in sunshine into the room and allow the air to circulate. If your house is centrally airconditioned, you may consider changing the air filter on the system to prevent recontamination of the house. Water borne diseases can be controlled by drinking only safe and potable water. If you are not sure of the water supply in your area, you may consider installing a water filter in your home. The home water filter systems will ensure that the water you drink is free of pathogens, thus preventing any water borne diseases. Keeping your home damp free and dry is another way to ensure the health and well being of your family. Dampness can cause fungus to grow, which can, in turn, cause fungal infections and breathing problems. If you spot fungus in your home, you need to call in a professional cleaning service to help you get rid of it. By Following this list, you can ensure that your house is clean and healthy. If you wish to hire a cleaning service in Dubai, you can check out the help4u.today. 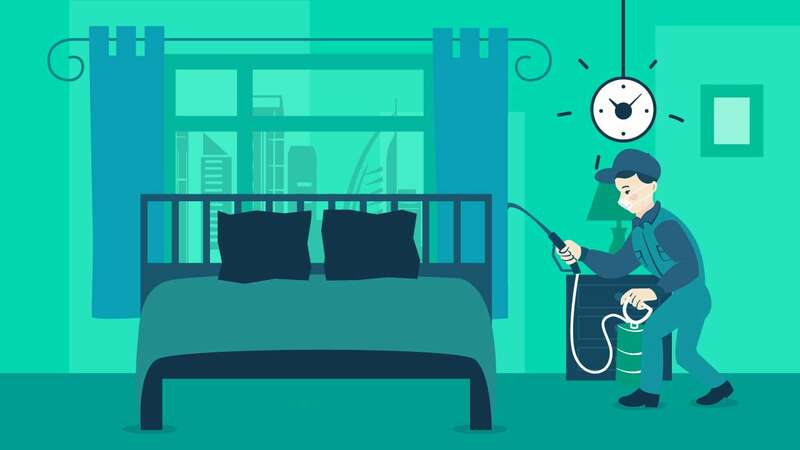 the best cleaning service in Dubai are listed here and you can find one easily and quickly based on the services you require, area where you live and the rate charged by the services. Keep checking this space for more interesting posts on living and cleaning in Dubai. Bedbug infestation may be a challenge in Dubai with its temperate environment being perfect for them to thrive. Proper pest control at regular intervals, as well as preventative measures can keep your home pest free. For many of us as dwellers in Dubai practical pest control beats the fix-it-by-yourself strategy we use daily. Choose a service, location and date. help4u.today is the online marketplace which connects service providers to customers through smart technologies. We open up more opportunities for users to choose from and compare different agencies for a wide range of services. As we live in a connected world, the thought of using mobile devices came inevitably to us. We let the customer monitor and track the services of the operators through the mobile devices during the working hours, enabling him to supervise them even if miles away from home.